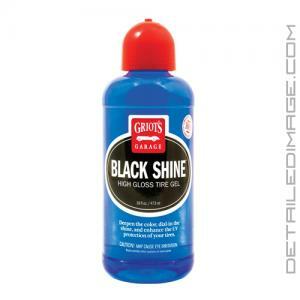 Create a dark looking, well protected tire with the Griot's Garage Black Shine Tire Gel! Contrast comes into play much more than you originally think when detailing. Have you ever seen a car where the paint looks like a million bucks, but the tires look like like, well, ten bucks? Dull, ugly looking tires can pull your eyes from the paint and really takes away from the overall look of the detail. The good news is this is easy to fix and with the Griot's Garage Black Shine Tire Gel, your tires will be looking like a million bucks in no time. The secret to this product is in the thick, heavyweight polymers that stick to the surface of your tire. the advanced gel provides smooth, even application and clings to the sidewall of the tire, reducing sling and making application a breeze. For best results Griot's Garage recommends cleaning the tire thoroughly first. From there, you can apply a quarter size drop of Black Shine to an applicator pad. Spread this evenly over the face of the tire and let it sit 20 minutes before driving. For higher gloss, a second or third coat can be applied as well. After cure time, wipe away any excess with a clean microfiber towel. What you will be left with is a dark, uniform looking tire that will stand out, not take away from your detail! Better yet, the water resistant formula will bead water and keep your tire protected from rain, road grime, car washes, and harmful UV rays. Use the Griot's Garage Black Shine Tire Gel and make those tires pop! Griot's Garage - Detailing Tip: Black Shine Tire Dressing Family - Which one is for you? Deepen the color, dial-in the shine, and enhance the UV protection of your tires. Black Shine High Gloss Tire Gel creates a darker, uniform color and adds a durable, glossy shine to your tires. We use thick, heavyweight polymers so this advanced gel provides smooth, even product application and then clings to the sidewall of the tire so it works for weeks. Our premium water-resistant formula beads water like a beaver pelt so Black Shine High Gloss Tire Gel will stand up to rain and car washes. Since it's a gel, there's no messy overspray and you have total control of gloss level so tires can be dressed with a sedate satin finish or a glossy show shine. USEFUL DIRECTIONS: For best results shake well and apply to clean, dry tires. Apply with a foam applicator pad. Spread evenly across the face of the tire and allow to setup for 20 minutes before driving. For satin finish wipe with a clean towel to knock down gloss. NOTE: Not for use on interior components; bicycle or motorcycle tires. To eliminate potential for sling, wipe excess with a microfiber towel. This stuff is way too thick, so hard to work with. First tried with a foam applicator, like directed, but once it soaked into the foam, it was hard to get out of the foam and onto the tire. It also would not get into the small lettering and "style lines" of the tire. I ended up using a toothbrush too, 1- not waste product by overly saturating a foam applicator, 2- force into all the small areas. This added an unreasonable amount of time to the process. It also left the tire with a blotchy (too glossy) look, so I followed up with a wipe down with a microfiber. This was a learning curve also.... wipe too hard, have "dry" streaks in the finish, use more of a buffing type action to get an even look. But, that left excess product in all the small lettering and style lines, so those parts ended up looking shinier than the smooth parts of the tire. Longevity? Don't know, don't care.... this stuff would need to last 1 year, for me to even think about using again! I doubt it will. Great products and even better customer service, that's Detailed Image!